Texas Instruments (TI) India, has hosted the “DIY with TI” event designed to recognize and encourage TI hobbyists who innovate in their spare time using TI devices, and showcase their creativity with innovations that help solve real-life problems. 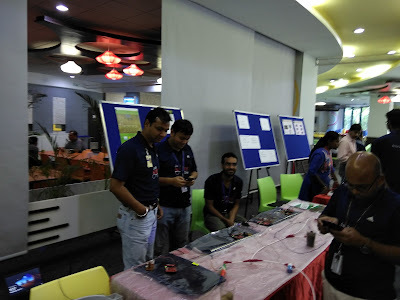 More than 40 engineers got together in teams at TI in India and showcased their passion for creating simple and innovative solutions by showcasing 15 interesting demos across home automation, agriculture, education, personal electronics, renewable energy, healthcare, etc. This year, S KeerthiBala Viswanatha, Priyankar Mathuria, Ankur Patel, Aarti Malgaonkar won the Chief Geek award for their DIY project ‘Non-invasive Blood Sugar Prediction’. The winners were chosen based on the potential of this application for creating future smart cities. Also, Abhijit Ray, Tarunvir Singh, Gaurang Kuchchal were recognized as runners-up for their project on ‘FINDO-track your valuables’. There were other notable projects in the realm of making solar energy harvesting with a smart tracking system, cloud based tracker to measure electrical power consumption in home, a pen that can remember what you scribbled- no paper required.